Below are answers to some of the questions we are asked frequently. If you don't find an answer to your specific question, please contact us. We charge $10 per month, or $120 per year. No, we believe that if we had to hold a member to a contract, then we probably aren't doing our job correctly. You may cancel your service with us at any time. I've heard of other companies that do this for free. Why do you charge a fee? There's no such thing as a free lunch--if someone offers you a service for free they are getting paid from someone else. When you buy a house and a real estate agent shows you around for free, it's because they will get paid by the sellers when you close. Energy brokers have been finding people the best electricity plan for their needs for years, for free, for years. While the service may be free to you, they are paid by the electric provider they enroll you with. The electric provider only allows them to sell plans with high enough margins to cover what they pay the broker, which leads to you paying a higher electric bill. So you still end up paying for the "free" service in the end. Energy Ogre doesn't get paid from anyone but our members. This means our only goal is to find you the best deal. Whether we save you $200 or $2,000, our fee stays the same. And if we can't save you any money, we tell you that before we make any changes to your account and refund your money. I'm in a contract with my current electricity provider, can you still help me? Absolutely! Once you have enrolled with us, we request your usage for the past 12 months from your utility provider, and then run an in depth analysis on your options, forecasting how much electricity you would use over the next 12 months based on how much you used over the past 12 months. If you are in a contract, we verify details of your current plan with you, and what termination fee you may have with your current provider. Once we have the options narrowed down, we will discuss them with you to determine if it makes sense to switch. If you are not happy with the options at this point, we can cancel your membership and refund your payment before any changes are made to your electricity plan. Will I have a contract with the electricity provider? Yes, we enroll you in electricity plans that typically require 6-month contracts, though depending on a variety of factors sometimes the contracts are shorter or longer, and rarely more than 12-months at a time. It all depends on your particular situation and what the marketplace is offering. Will you ever put me in a variable rate plan? No, our systems only consider fixed-term, fixed-rate energy plans, and we would never enroll you in a variable plan. Will I have to tell my current electricity provider that I'm leaving? No, we handle the break-up with your provider. Once you hire us, we take care of cancelling your old service, starting your new service, ensuring everything goes alright and actively managing your account on an ongoing basis. How can you get me a low rate every time? Unlike most other industries where your rates go lower the longer you stay with a company, in the electricity industry the best offers are almost exclusively reserved for new customers, and the prices usually go up when you come up for renewal. Our systems constantly monitor the market as well as your usage, and pick out the offer that saves you the most money and meets all of your preferences. How often will you switch me? We typically switch our members every 6 months, though depending on a variety of factors, we may rarely enroll you in a shorter term plan to get you in position where we can put you in the lowest offer for the longest possible term. Will my power go out when you switch me? No, your power will continue to flow without any interruption. The switch between electricity providers is entirely a financial process, and no physical changes are made to your electricity delivery systems. Yes, you will continue to receive statements from the electricity providers we enroll you with. We recommend that you opt in for automatic payment so you don't have to worry about determining which electricity provider to send a check to, though we set up your account to match your preference. After you switch me, who would I call if my power goes out? When you switch electric providers, all that changes is a financial responsibility for billing. The utility that generates and delivers electricity to your home sends a bill for what you use to your new electric provider, and they turn around and bill you for it based on the terms of the contract you signed with them. Nothing about how your electricity is generated or delivered to your home changes. So if you live in the Dallas area, your electricity is delivered by ONCOR regardless of who your retail energy provider is. When you have a power outage, even if you call your electric provider to report it, the requests are always handled by ONCOR since they own and service the lines and the equipment. 100 duck-sized horses, because seriously, a horse-sized duck sounds terrifying. Do people actually ask that question frequently? What do electric companies think about this? Electricity companies often spend $100 or more to acquire a customer. When we enroll a customer with them, they get it for free, which is a great deal for them. People switching providers is a daily occurrence for electricity companies and usually not a cause for concern to them. Because electricity is typically paid for after the service has been provided, the electricity providers are required to validate your identity. To do this they run a soft credit check that requires your full legal name, social security number and date of birth. Some providers also use this information to determine if they would require a security deposit. If you look at the address bar in your browser while you are signing up, there should be a green padlock icon. This icon confirms that the connection between your computer and Energy Ogre's servers is secure. It also means that every bit of information that you enter in your browser is first encrypted on your computer before it is sent to us, so even if it is intercepted by anyone it would be unreadable. The information is then encrypted and stored on our servers, and only shared with a retail electricity provider when we enroll you with them. Energy Ogre does not and will not ever share your information with anyone without your permission. How does the Savings Calculator work? The savings calculator gives potential members a rough idea of how far away their bills are from what we could help them get. We use information that you provide from a recent electric bill to determine your estimated demand curve, which is a series of numbers that show about how much electricity you would use over the next year. We then estimate how much you would pay during that time if you stayed with your current provider, as well as if you were with any of over a thousand active currently available offers in our systems. We pick the top 20 offers from that, and show you how much money (if any) we may be able to save you. The accuracy of the savings dollars in our calculator depends mostly on how close your consumption pattern resembles the average consumption pattern for people in your geographic location. The savings calculator uses the average profile for your area and then we ratio your consumption to the average for the rest of the 12 month period. In other words, let's say you use about 10% less power than other homes in your area for the month we used to determine your annual savings. If you consistently use 10% less than the average throughout the year, the calculator is extremely accurate. Other than that one variation, all other calculations are accurate, because it takes into account TDSP charges, usage specific fees, taxes and every other type of fee that an electricity plan may include. When you sign up, we collect additional information from you that allows us to request how much electricity you used over the past 12 months from your transmission provider. With this data, we construct your actual personal demand curve and rerun it against the offers available in the market. We take your preferences into account and factor in any early termination fees you may have with your current provider. Once we have the right plan, we enroll you in it. How is your service different from Power-to-Choose? The Power-to-Choose website is extremely confusing for most people, even if they don't realize it at first. It is one of the primary reasons that our business exists. 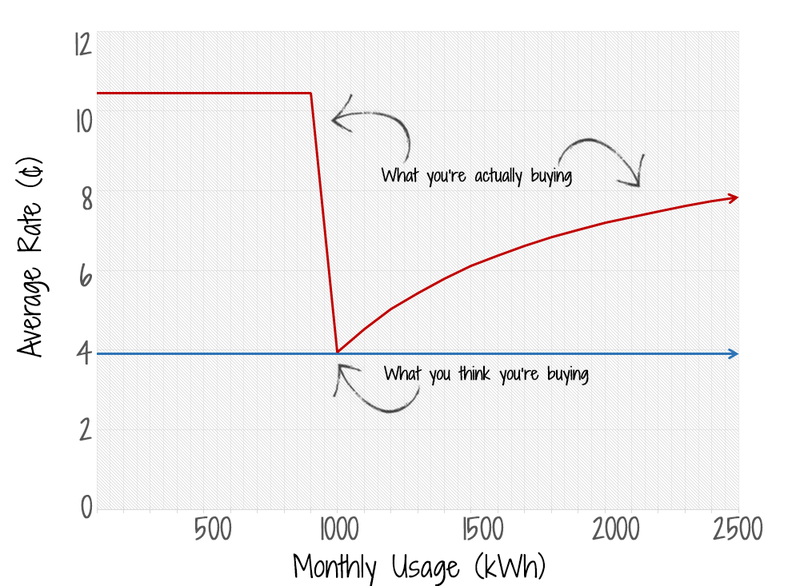 The Power-to-Choose is a marketplace where retail electricity providers post their best offers, and while they are required to disclose all the specifics of an electricity plan in their Facts Label (EFL), the information that's most prominently displayed is what the rate per kWh someone might pay at exactly 500, 1000 and 2000 kWh per month. As the market becomes more competitive, rate programs have become very complicated and highly structured for the most part. Average rate-per-kWh is not a very good way of judging an electricity plan because most of the offers are actually curves. The price is different for each kWh of consumption, and many times now the rates are structured with energy or consumption credits that result in an inflection point on the price curves. This all adds up to lower than realistically achievable rates, because the credits and break points happen at 500, 1000, or 2000 kWh exactly. The problem is that almost no one consumes exactly 500, 1000 or 2000 kWh a month, let alone for 12 months. 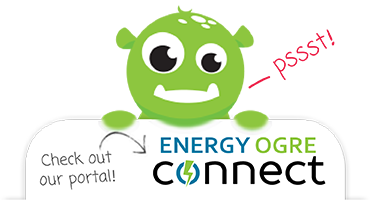 Energy Ogre's systems interpret the rate offer in its entirety, taking into account every fee, pass through charge and taxes, for any amount of consumption--not just three points. This allows us to predict within a reasonable amount of certainty exactly how much an electric bill would be in dollars and cents for a given month. This is vastly different from just looking at offers on a marketplace. Moreover, we do all the work. Once you sign up with us, we pick the best offer, enroll you with the provider, ensure your account is set up and we actively monitor your account month after month to confirm that you are only being charged what you should be. If you run into any issues, we handle them for you. And before the plan is up, we start the process all over and get you switched over to your next plan before the old one expires, so you never pay out of contract fees. Because we are actively monitoring your usage and all new offers that come available in the market, should a great offer come along and it might make sense for you to switch, we contact you about it. With your permission we can move you over to any new plan that saves you the most money. Couldn't I just do this on my own? The amount of effort involved in regularly monitoring usage, constantly running it against what's available in the market, and making the changes would be quite significant. It is unlikely that you would be able to get the same results as our systems by doing this manually. Can you service your own vehicle? Probably, but most people prefer to hire a professional to save time and to ensure it is done correctly. While it is technically possible for you to do what we do yourself, for $10 per month most of our customers decide that they prefer to have us take care of it all. Can you guarantee I'll save money? We can guarantee that the rate plan we'll put you in will have been vetted and the rate program will be accurate for the length of the contract, with no hidden fees or surprises. What we cannot account for, however, is if your electricity usage is much higher (or lower) than it was at the same time last year. If you use much more or less electricity than you have before, in addition to your bills amounts changing, the optimal plan for you in might be different. We encourage our members to let us know if they expect a sudden change in their consumption before it happens (when you're expecting construction on your house, or when you have someone new move in to your home, for example). We can analyze the situation and determine if it makes sense to move you to a different plan. That being said, we understand that while the convenience of letting someone else handle your electricity shopping is a great perk, many people would not want to use our service unless it saved them money. All our processes take this into account, and we will let you know if we can't save you money, and give you the option to cancel your membership, before we make any changes. Why does this sound too good to be true? We firmly believe that a deregulated electricity market is a great deal for Texans, though most of us truly haven't benefited from it. The folks that actually pay attention to their electricity choices often feel like the game is rigged against them--and for good reason! Anyone that has taken the time to read through an electricity facts label (EFL) would agree that the process is far more complex than it ought to be. We have spent more than 13 years becoming experts with the rules and regulations of the industry, and we read every word of the fine print. While we can't change the game, we do know how to play it really well. So why does it sound like it's too good to be true? Maybe because we really like what we're doing--maybe a little too much. You could say we are a bit ogre-the-top about it. Does your service work for me if I live in a Co-Op or a Municipal Utility? Unfortunately, virtually every area served by a Co-Op or Municipal Utility in Texas is not opened for retail competition. That means that we would not be able to select an alternative provider for you, so our service would not be beneficial to you. Yes, we do! You can sign up for service on our website just like any other residential account using your first and last name and your business address. Once you're signed up, we will reach out to you via email to confirm your business information, provide you with available rates on the market, and guide you through the contract process with the provider offering the rate selected. If you have any questions or would like more information, feel free to call us at (832) 975-1000 and choose option 3 to speak to a commercial representative!